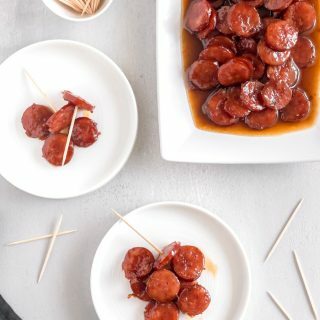 With just 3 ingredients, these Brown Sugar Glazed Kielbasa Bites will be your favorite go-to appetizer for holidays, dinner parties, or snack time. WARNING: They are quite addictive. I’ve been making these bites for years! What started as a little experiment has now turned into a delicious recipe… er obsession. Quite possibly, the recipe I make the most often when I have company over. 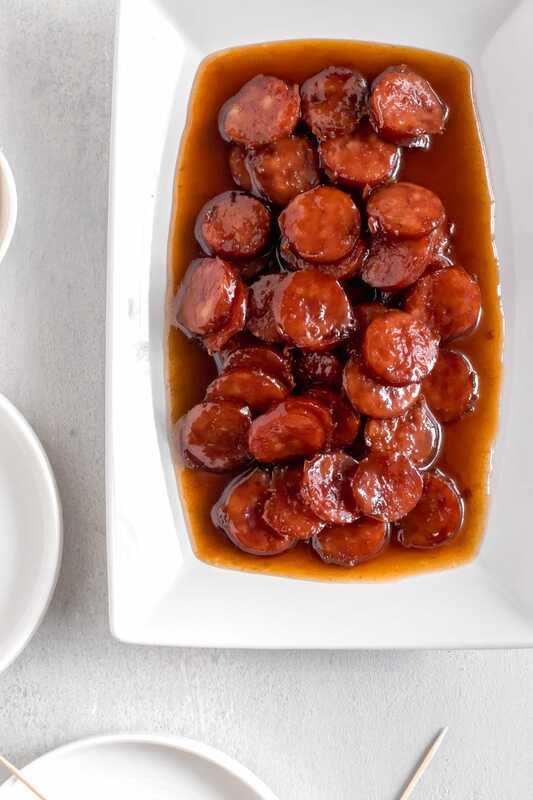 My friends ask for Brown Sugar Glazed Kielbasa Bites almost every time they come over my house and, even when I go over their house! Yep, I’ve even made these in other people’s home. My friends and I have been affectionately calling them coke sausage through the years. Ha! This is why I always have kielbasa sausages on hand. They are an awesome appetizer and a quick bite to make when you have unexpected company. Thankfully, they are SUPER easy to make and come together in no time. And I mean, it’s only 3 ingredients! The caramelization waiting time is really the hardest part of this recipe. Just be careful not to eat them too soon after you transfer them to a plate. They are definitely hard to resist but you don’t want to burn your mouth (speaking from experience here). Also, please note, not all stoves are created equal. As I mentioned above, I’ve made these kielbasa bites before in other kitchens. Sometimes it takes 10 minutes, other times it takes 35 minutes. You will have to eyeball the glaze to see when the brown sugar + coke mixture thicken. You know your stove better than I do. Use your best judgement when making these. From appetizers to simply having them served over rice for dinner, you can’t go wrong with these little bites! I promise you will absolutely LOVE making them (and eating them too!). I see these in your future! You too are going to be making these over and over again. In a skillet, add sausage and brown over medium high heat for about 4-5 minutes. Pour cola and brown sugar into the skillet. Reduce heat to medium low. Once the cola and brown sugar mixture become a glaze over the sliced sausages, remove the skillet from the heat. Transfer sausages to a plate and let cool for 10 minutes before serving. The sausages will be VERY HOT, please be careful. Enjoy! I am totally making these on NYE!! Can I use root beer instead of Cola???? It worked out well and was not an overpowering taste but a slight taste of the Dr. Pepper, but definitely sweetened the taste of the Kielbasa, but that could have been the brown sugar as well. Do you think it would be an equally delicious turnout if you used the slow cooker instead of the stove top? Hi just wondering if anyone tried the slow cooker and if so how they turned out?? I am trying it out in the slow cooker tonight and will let you know. How did these turn out in the slow cooker?? These sound delicious! Do you use already cooked Keilbasa? I haven’t tried this recipe yet, but I intend to because it looks so good. Allow to me add that not ALL Kielbasa is cooked/smoked. There is such as thing as fresh (uncooked) kielbasa (I’m a Polack who was practically raised on it) which is cooked by simmering it VERY SLOWLY in a pot of water. Then it can be sliced into pieces and combined with kraut or eaten in a sandwich on seeded rye bread with horseradish….yummy. Just sayin. What’s the best type of skillet to use for this? Cast iron, non-stick, stainless steel? I can’t wait to try them! I’d like to try these today, but not go to the grocery store! I only have diet coke. Would that work? Made these last night for a party and everyone went bananas over them. Thank you! 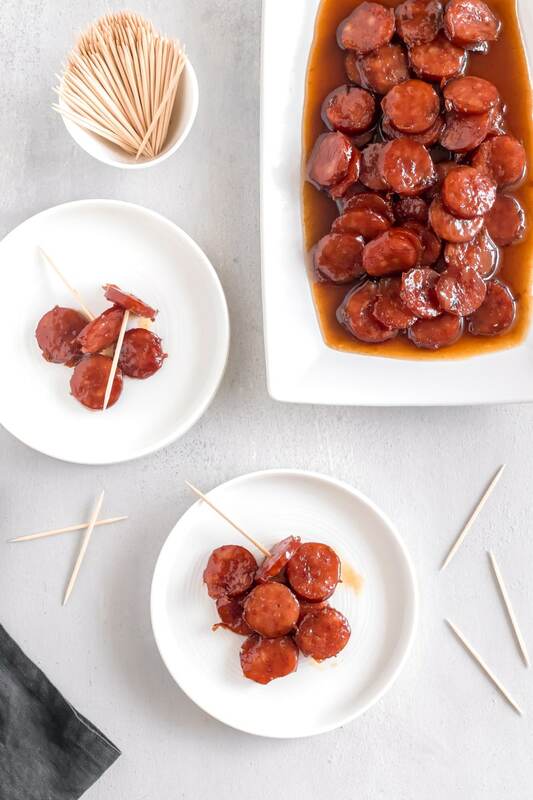 I made the 3 ingredient brown sugar glazed Kielbasa bites, but my kids love red kidney beans so I added the Kielbasa with the beans and it was out of this world. Going to try this tonight. Had planned a different recipe but that one wouldn’t be ready in time. This sounds faster and just as good of not better than what I do in the Crock-Pot. Typically I just slice thin throw in Crock-Pot and add a bottle of sweet baby Ray’s barbeque and brown sugar and let cook low and serve over rice. I’m curious if anyone’s tried this recipe in Crock-Pot before. Saw a few who wanted to try but never updated it. Anyone have an update using the slow cooker? Yes, the slow cooker works but you don’t get the crunchy outside. I typically brown the meat in a skillet and then transfer it to the crock pot. I have cooked these several ways in the past and you really can’t go wrong. I call my version Candy meat. Also, the recipe should include the weight ratio for the meat and not one package. At my grocery store there are three different types of kielbasa and two different weight packages. I was wondering about the weight of the package also. I bought a pack from Costco and I’m sure it’s alot more than a “regular size” pack. Looking forward to trying this though! I’m thinking of making something similar for a bridal shower. Has anyone tried it with chunks of pineapple, onions and peppers? I think it will look nice with the different colors and served with rice. I will definitely also try it with the 3 ingredients for other occasions. It sounds so good and simple. I would like to prepare these before my party starts. Can they be reheated? Can I use uncooked Kielbasa? Boil till done then follow the recipe? This was delicious! I didn’t have Pepsi, so I substituted with root beer. Oh my goodness, I may not even try with Pepsi next time! It was so good with root beer! Easy, yet great tasting supper!